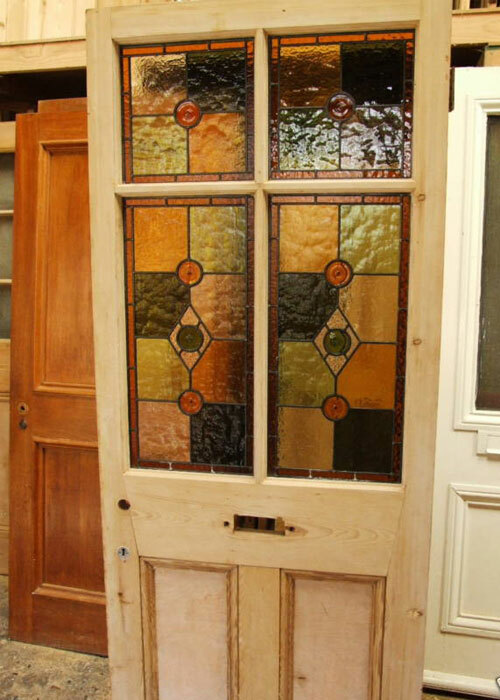 Antique Victorian Stained Glass Front Door. The stained glass panels have amber and olive handspun rondels. The background colours are pastel shades of ambers and greens made from handfloated glass. These doors can be painted in a colour of your choice or varnished using a clear acrylic exterior varnish that will not crack peel or yellow unlike oil based varnishes. If you would like the door painted a colour which is not listed below, please leave details in the comments box when completing your order, or call us on 01730 828444 to discuss your requirements. If you wish to have your door painted or varnished an extra £180 will be added to the price.